According to the Philadelphia Zoo, the king cobra is the world’s longest poisonous snake. Found throughout India, China, Indonesia, the Philippines and the Malay Islands, this dangerous snake species separates itself from other snakes in two ways. According to Rivas and Burghardt's 2001 discussion of sexual dimorphism in snakes, the female is usually larger than the male in most snake species. But among king cobras, males are heavier and longer than females. Males can be more than 18 feet long and can weigh up to 44 pounds. 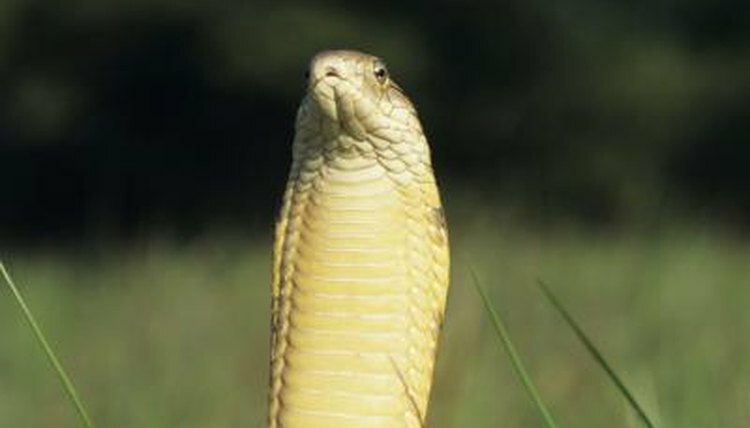 In comparison, an adult female king cobra who lived in an Indian zoo was only 12 feet long upon her death in 2009. Most snakes do not build nests for their eggs, but female king cobras build complex nests and remain nearby to protect them. While male king cobras typically try to avoid fights, female king cobras become aggressive toward potential threats while they are guarding eggs. Unlike male king cobras, females will remain at the nest for up to three months. When the eggs hatch, the mother cobra leaves. Of the 20 to 30 eggs she lays in her nest, only one or two of the hatched baby snakes will live to be mature king cobras.